As a woman, you will go through a lifetime of changes—from puberty to menopause—and everything in between. You have unique health care needs. At Aurora BayCare, our women’s health providers specialize in providing sensitive, respectful care for women of every age. We emphasize preventive care and education to help you optimize your health, throughout your lifetime. When medical intervention is necessary, we offer some of the region’s top specialists in women’s care along with state-of-the-art technology for diagnosis and treatment. You have access to over 20 minimally invasive procedures offered by over 90 doctors in the area at Aurora BayCare Medical Center and its clinics. 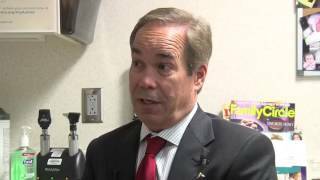 We are the area leaders in minimally invasive laparoscopic and robotic surgery. Minimally invasive surgery offers you the benefits of incision-less procedures (or smaller incisions), fewer stitches, shorter hospital stays, faster recovery, less bleeding, less discomfort, and reduced risk of infection. 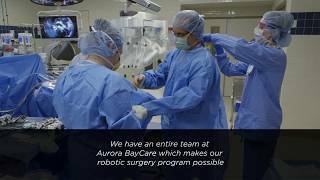 Aurora BayCare, part of the Aurora Health System, is the first provider in Wisconsin to perform robotic assisted gynecologic surgery. Robotic assistance enables your surgeon to perform complex and delicate procedures through tiny incisions and offers you all the benefits of minimally invasive surgery. Many hysterectomies and myomectomies (a procedure in which fibroid tumors are removed while leaving the uterus intact) can be performed utilizing robotic surgery. procedures to you to help you to live more fully, and comfortably, all month long. Tubal ligation is performed laparoscopically and involves tiny incisions near the navel. Typically, you go home the same day. Essure is an even less invasive procedure in which the Essure device is implanted vaginally. This is also a same-day home procedure. The most common surgical procedure prescribed for women, over 70% of hysterectomies performed at Aurora BayCare Medical Center utilize laparoscopic or robotic procedures, as compared to the national average of 32%. If you qualify for a minimally invasive hysterectomy, it is highly likely you will be back in the comfort of your own home that same day. Under new health care regulations, insured women can receive annual preventive care and birth control with no out-of-pocket costs. Learn more about free preventive care and make time to maintain your health. For your convenience, routine OB/GYN care is available at two Green Bay locations: Aurora BayCare Medical Center on Greenbrier Rd. and Aurora BayCare Health Center on W. Mason St. Both locations offer extended evening hours, digital mammography, and ultrasound services. 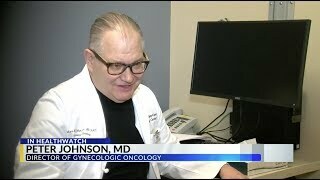 Dr. Brian Dobbins discusses when women should visit their gynecologist instead of searching the internet for answers.